Nike Dri-Fit and Polartec - Whoa. I may not share any of this with you people. I bought two bolts of Nike Dri-Fit knit fabric and one bolt of Polartec Powerstretch Hardface. It’s hard to photograph black fabric. I’ll give you guys more details in the next few days but I want to see how much I want to keep first. Nike Dri-Fit Hexagons in Anthracite (a very dark gray). A Nike Dri-Fit Brush-Back Knit in black. This is my favorite. It’s soft like the softest suede on the inside. It’s thicker weight and will be perfect for running pants. It’s not Lycra-shiny either. This is Polartec Powerstretch Hardface. It’s fabric leftover from these Mountain Hardware jackets. It’s a dark gray with black lines printed on the top of it. The inside is a fleece. It’s lightweight and thin but still has water repellency. This is a sampling of some of the colors I could have bought. I almost bought a bolt of this color too. This is the color I have. I will figure out what I want to sell and what I want to keep. I might keep all but five yards or so of the brush-backed fleece. It’s yummy. I will make a post showing the fiber content, percent stretch, and all that other good stuff in a few days. I’ll also try to figure out rough estimates for shipping costs. Anyone interested before I start running numbers? I just had to. Really, I did. Are these curtains not THE. BEST. Perhaps a little too garish for some but I like me some RAWR every once in a while. As you can see, the walls are painted now. I am still rearranging furniture but I had to show you the curtains. They aren’t even hemmed yet but I just had to show you. I love them. The rest of the bedroom is pretty low-key; very neutral, very sedate. I wanted to rev it up a little with some pattern. I think it will still look great with the purple duvet I made here. Are the colors not fab? This is a cotton sateen so it’s a bit thicker and is nice for blocking light and sound. The view from our love bed. I’m hoping to sew a little for me this weekend. I want to make that bias-cut dress out of the newest Burda. Love that dress! Whew. More home remodel crap . . . So, I know this is not sewing related. Feel free to skip on by this if you aren’t interested in my lovely 80’s home and my attempts to purge the dark wood, almond outlets, brass fixtures. Here is what my master bedroom looks like before. That wood beam is not as pretty as it looks here. When you get close to it, you can see it looks cheap, like layers of 2 x 4 glued together. Well that’s what it is, duh, it looks exactly like it’s supposed to, a glue-lam beam. I didn’t bother to clean or pick up at all for these photos. I figure, the worse it looks in the Before photos, the better it will look after. Here’s the love bed. Baum, chicca, BAUM, baum. You’ve already seen this when I made my purple duvet. I just changed it to white. Here’s where I am now. I know the rage is gray walls but Alaska is so gray in the winter. I need some warmth in my house. The walls are going to be this medium brown. Dark enough for some contrast with the ceiling but light enough I can live with it in the winter. I’ll keep you posted. My next sewing project deals with this room too! This pattern is like comfort food. It always seems to make me happy. This version is much different than my last version because the fabric is super drapey. I really like it. It’s a deep purple eggplant color. I realize it’s hard to see in these flash pictures. And excuse my beautiful hat-head. I help coach kids at the local elementary school and I get home later than normal. On the plus side, I get to see my kids every day when they are with my ex. The kids are excited about running with Mom so it’s double win. Let’s see, what else can I tell you? I made the same modifications as the last time. Basically, I added an inch or so in length and added about two inches in the length of the arms. The fabric is a super nice thin sweater knit I bought from Fabric.com. You may be surprised by my next sewing adventure . . . Remember these cute skirts? Well, I made one more because Little Mrs. Thing decided she needed one in this pink fabric. With sparkles. NOW. I don’t usually give in to a three-year-olds demands but it was going to be so cute I couldn’t resist. The body is made from a jersey and I didn’t hem the layers. The top “layer” is just black ribbing material. Turns out, it doesn’t have enough stretch so I ended up zigzagging another piece of elastic to the inside of the black ribbing. I also had to add blingies. This is the same kind as the ones I used on my shirt just a couple of days ago. I forgot to tell you there are different varieties of blingies. Jalie 2796 - Running Skirts - CUTE! I seem to be doing more and more kid sewing these days. The three kids in school are in soccer and running. The girls wanted a running skirt “just like mom’s” so I made them each a super-cute (if I do say so myself) running skirt. I will make myself a few of these for next summer too. Right now, we are in hard-core fall temperatures and I won’t be wearing anything like this for months. The Jalie ones are supposed to have either a compression short or hot pant under them. I made these with just the skirt because I knew the girls would have to wear them with warmer pants. They have running pants so this skirt will just go over that. Jalie also has you put elastic at the top of the pocket. I’d like to say I left it off because of a sound reason, but really, I just forgot. I made the kid’s size 6 and it fits the girls very well. It surprised me that the waistband was so snug on them though. They are skinny for their age and this probably won’t fit by the end of winter. I’ll definitely check the waist measurement before I make one for myself. One thing I love about this pattern is they don’t use elastic in the waistband. They rely on negative ease to make everything fit. I also love the side overlaps that form the pockets. Practicing stretching on the lawn. Love her Running Rubber Boots? I used SewkeysE Double-Sided Fusible Stay Tape to fuse the edges together before attempting to hem them. The side panel are made out of a polyester ITY and wanted to roll all over the place. I love this top. I know I could have taken any old t-shirt pattern and added this contrast piece but, if you’ve been around this blog long, you know I have no creativity. None. At. All. In the magazine they show this knit top with contrasting solid fabrics like satin and a black jersey. Cute, I thought. I made mine out of a purple knit (kind of thicker like a sweater knit but not really thick). I used gray wool suiting for the contrast panels. I added the bling on my own. Love the bling or is it too young for me? I’m closing in on 40 over here. But, I sorta love the bling. Oh, and who doesn’t have a kudu head on their back porch? Here’s the close-up with the bling. The original pattern uses a facing for the neckline and has a keyhole opening in the back with a button. I used a self-fabric binding for the neck instead and did away with the opening in the back. This has a very small neck opening. With the added neck binding, it’s hard to get over my head and I have a small head. Be warned, fat-headed people! Here’s the inside. I used a regular straight stitch for the panels. I found this ultra cool hot-fix Iron-On Art at Joann’s on clearance for $0.50. I bought all they had. I’ve used it a few times already and it’s so fun! It seems to really stay on too. It’s in three layers, a black plastic sheet, the blingies, and then a clear plastic “tape” that holds the blingies in place. First, you peel off the black plastic. Then you stick the “tape” and blingies to the fabric. You can see on the right side where I cut and added some individual stones. I love it because the “tape” holds it in place and you can reposition it if you need to. You go to the wrong side and iron for 10-15 seconds. On mine, I covered the purple knit with pressing clothes because I don’t know the fiber content of the knit. I bought it at the San Diego Swap Meet. Why didn’t I do it before I sewed it on? Well, I wanted to do a little fitting just to make sure I liked it before I wasted my bling on it. It’s like Elaine’s “Sponge Worthy” test on Seinfeld. I only have so much bling. Of course, I can always buy more. Elaine couldn’t. Readers, tell me straight. Do you like it? I like it but I’m also attracted to all things short, shiny, and tight. I must be related to Heidi Klum. I still like the pattern, particularly the blue dress with the belt and shoulder pleats. I tried using a light-ish (more on this in a second) denim and topstitched all the pleats, seams, and belt. One thing I didn’t realize about this pattern when I bought it, is that there is no closure. It slides over your head and then relies on elastic in the waist to make a pleasing fit. I still have hopes for the dress. 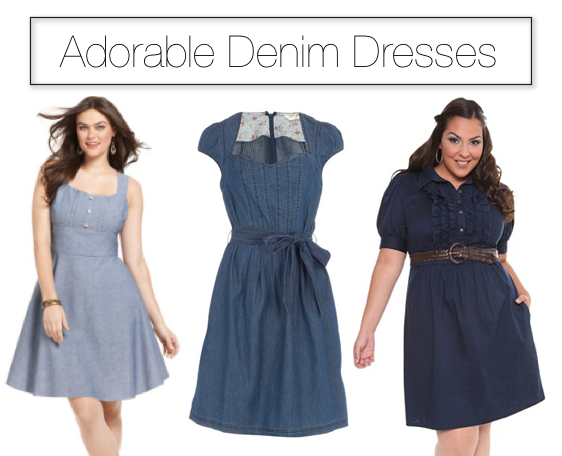 I was thinking a cute little dress like these ones below. Alas, my version was not like this. When I pulled this fabric out, I thought, “Perfect! Lightweight denim. This will be so cute!” Well, it’s too thick even for a dress like this. It might be cute at this weight if it was more fitted but it’s not fitted at the waist so there are lots of thick gathering going on there. It’s also a smidge short in the bodice. I still think this could look great in a lighter weight fabric. A chambray would be really cute, I think. Or a voile. Or a shirting weight fabric. Hmmmmmmmm. With all the great things Burda is putting out these days, there is no lack of patterns to sew! I’m loving them again these days. They lost me for a while. I’m tracing something out right now.